Note: I received an ARC copy of this title from the publisher as part of the pre-publication tour. All thoughts and opinions are my own. I was not paid to write this. I absolutely ADORED Tell Me Three Things by Julie Buxbaum. It’s one of my favorites thus far this year. Definitely, one of my favorites! What initially sucked me into Tell Me Three Things was the main character Jessie and her voice. I absolutely loved her. You know how us book lovers talk about what characters we would date or be friends with. Well, Jessie and I would have to be friends. I don’t think there has been a character that I’ve connected with as much as Jessie. She had me exclaiming, “I say that all the time!” throughout the book. Seriously, it was kind of freaky but very cool. Aside from my love for Jessie, I loved that the story was full of heart and layers. At its core, Tell Me Three Things is definitely a romance. Jessie meets SN, they exchange emails, they start to like each other, and Jessie becomes a tad bit obsessed with finding out who he is. See romance. But it’s also about friendship, family, grief, and ultimately dealing with change. Losing a parent can’t be easy. It’s probably even more difficult when you’re forced to move states, leaving your childhood home behind and all of your friends. Not to mention your father has been lying to you, and you now have a step-mother and a step-brother. Um, that’d be hard for anyone. Watching Jessie overcome her problems and make a place for herself was amazing, and it wasn’t perfect. Plus, I was one of the readers that guessed SN’s identity pretty early on. It didn’t seem like much of a mystery. If there was one thing I could have changed, I would have wanted to see more interaction between Jessie and her new step-brother. Their relationship wasn’t smooth at the beginning, but I loved what it developed into. I wish I could have seen more of them together and seen a bit more character development for him. 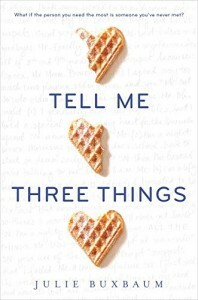 So if you didn’t figure it out yet, I highly recommend Julie Buxbaum’s Tell Me Three Things. It’s not just a romance. 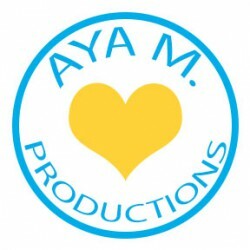 It’s a story filled with heart and growth, I think many would enjoy. & If you read Tell Me Three Things, I hope you love it and Jessie just like I did.